I knew going into the weekend that getting everything that was on my to do list done wasn’t actually possible, and I got even less done than I had hoped for, but it was still a productive weekend. I even got a sewing project done on my new sewing machine. I can’t show the project yet because it’s a birthday present, but the unveiling will be soon. I started Saturday morning by going to the farmer’s market downtown. I was going to walk, but I’ve been inconveniently congested for about a week now, and when I woke up Saturday, I just didn’t have it in me to make the trek downtown, especially since that would have meant lugging all my veggies home. I’ll have to make that my mission another day. Then, I won’t feel as bad about the calories if I — oh, I don’t know — eat an amazing caramel apple filled donut. Here’s the pile of veggies that I came home with. Next time, I’ll know better to check about the source of some of the veggies since I pulled a grown in Mexico sticker off the eggplant, but I guess it’d be a little hard for the produce to all be grown locally right at the moment since we’re just finally seeing sunshine. 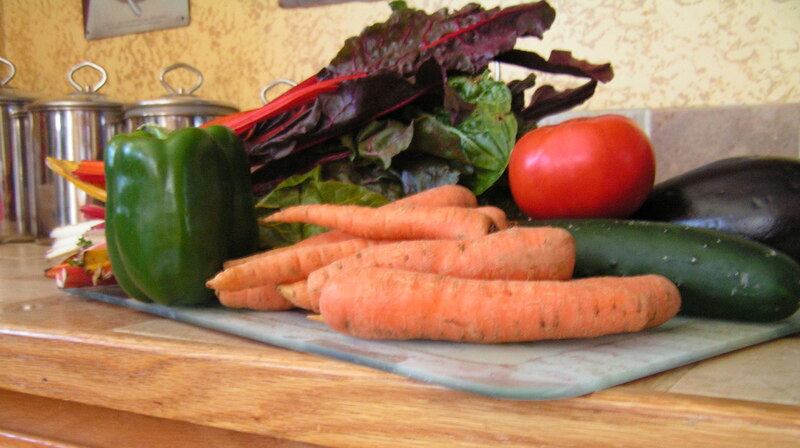 The rainbow chard and the carrots came from an organic stand though, and they went into a soup that was nothing to write home about. Still, at least lunch is ready for the week even if I most likely won’t be giving the recipe a permanent home in my recipe book. Saturday evening was girls’ dinner night at a friend’s house. She did an awesome job setting the table with beautiful spring flowers, and each guest was supposed to bring a spring dish that started with “s.” I took my cool and colorful salad, but for Saturday night is was known as spiral pasta salad. Shhh… don’t tell. I’ll put the recipe here. It’s an old family favorite, so my apologies if someone isn’t getting appropriate credit, but I just took it from my mom’s cookbook. If anyone out there is looking for some summer lunch ideas, here you go. This salad is perfect as a light meal on hot summer days. And, it makes a ton. I took it to the party in my 4 quart Pyrex bowl, and there was just enough room to toss the salad without getting it everywhere. 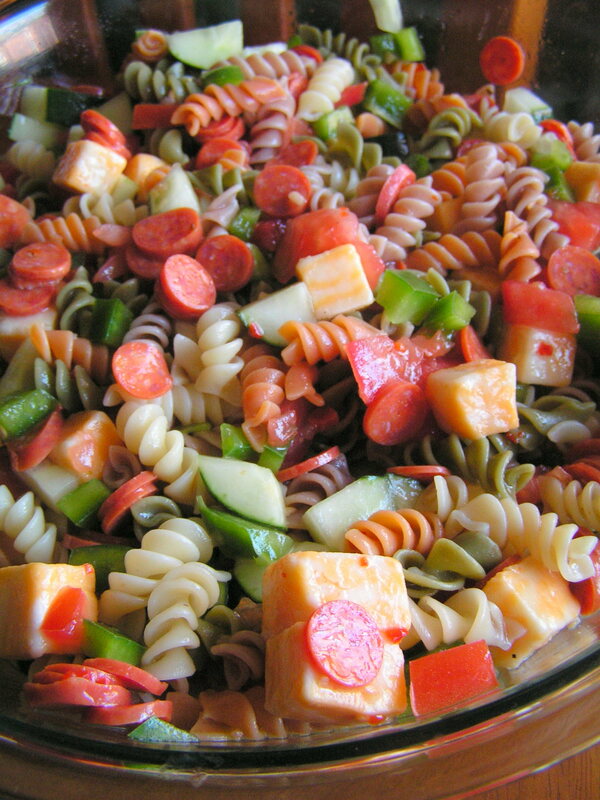 When (not if) you make the salad, cook 1 lb of tri-colored spiral pasta. This isn’t rocket science, so if you can only find a 12 oz bag, as was the case last Saturday, that’s fine too. I felt like there was plenty of pasta. Don’t let the pasta get mushy by overcooking it. While you’re waiting on your water to boil and the pasta to cook, you can cut up all the wonderful fresh veggies that go into the salad. I used one tomato, one green pepper, and one cucumber. I usually also add a can of sliced black olives, but I forgot to get them this time. The recipe also suggests onion, broccoli florets, and fresh sliced mushrooms. I never add them, but you can add basically anything that you want in whatever proportions. The “official” recipe calls for two tomatoes, and I might go with that next time. You’ll also notice my cubed cheese and mini pepperonis in front of the beautiful looking mix of tomato, pepper, and cucumber. I recommend adding these two ingredients. You don’t have to, but I do. I recommend cubed instead of shredded cheese for the sake of texture though you can do shredded. And I spring for the mini pepperonis when possible, so I don’t have to slice the full sized ones. The recipe also suggests adding bacon bits if desired, but I’ve always used pepperoni. Toss everything together. You’ll probably need to dump everything from one bowl into another larger bowl because you didn’t believe me when I said that this recipe makes a ton of salad, but that’s ok. You’ll learn. Then, for the dressing, the recipe calls for 8 oz. of Italian dressing. I recommend buying a larger bottle because in my experience, a little more dressing is sometimes needed after the salad chills in the fridge. 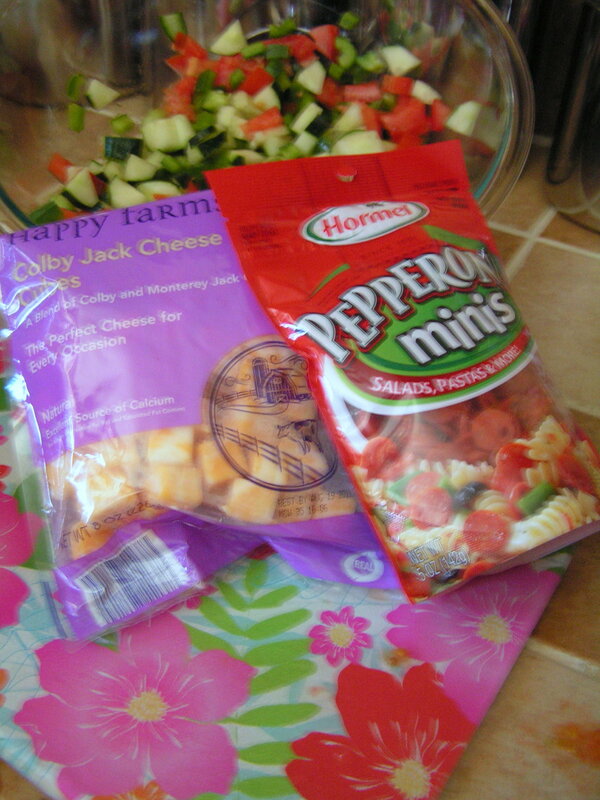 Once you mix the Italian dressing into the salad, put in 3 tablespoons of McCormick Salad Supreme. Make sure you add that. This recipe is all about customization, but trust me when I say that leaving the spice out is a huge mistake. Somehow I always forget to pick up the spice when I’m out shopping for other ingredients. I can’t tell you how many times I’ve had to make another trip back to the grocery store (like on Saturday) or how many times I’ve found myself racing through the grocery store on my way to a party just so I can get this spice. The grocery store had it on sale on Saturday, so I stocked up, but I bet you anything, I’ll still find myself in a spiceless predicament sometime in the future. Mix the spice in well, and make sure everything is coated by the Italian dressing. Chill everything in the fridge for 2 hours. Eat the salad. Come back to post and tell me how good it was.